Annamarie Harris Romero was awarded an Honorable Mention for Nonfiction in the 2018 Prison Writing Contest. Life’s journey is paved with poor choices and missteps that can lead to a lifetime of shattered illusions and broken promises. For me the struggle has always been in believing that I wasn’t the only human that had taken this many wrong turns. I was always wishing I could go back and re-sketch a particular portion of my life portrait and perhaps redirect the course my life has taken. We are human. We make mistakes. Sometimes we make a huge mess of things. If we are lucky, we get an opportunity to make amends. If we are truly blessed. . . we come face to face with forgiveness for ourselves and for others. It was 1976. I was seven years old, in the first grade, and wanted nothing more than to be in the school talent show. It wasn’t even important to me if I won. I just wanted to be on that stage. I picked my song and I practiced it every day. I was scared to death. I kept my focus on my mother. I knew with her there I could make it through anything. As I finished my solo and rejoined her in the audience, a boy took the stage. He presented a “comedy” routine comprised mainly of racially biased, off-color jokes depicting African-Americans in a very negative way. But that’s not what happened, and for years I carried with me a painful, albeit mistaken reality. In my childish innocence, I thought that the tears I saw in my mother’s eyes that day were caused by embarrassment and regret. Feelings that I believed were a direct result of adopting me. Until I had children of my own, I wasn’t able to understand the magnitude of what my mom felt that day. I realize now that she was feeling the guilt and the pain of what she perceived as a failure to shield me from the ignorance of some people and from the harsh realities that life sometimes throws our way. The next link in my chain of regret would have to be the Great Lake mistake of ’77. Apparently as traumatic as it was for me, it was of no national importance. Contrary to my personal beliefs (at that time), it really wasn’t worthy of holding on to and using it as a twisted ticket into martyrdom for so very long. It was, however, a disheartening and premature realization to an eight-year-old that there is no such thing as a “perfect parent,” and daddies can and do make mistakes. To a child that still believes in fairy tales, it was nothing short of heart breaking. My father (God rest his soul) loved fishing. Although he seldom caught anything, the lake was his “happy place.” On the rare occasion when his grandchildren came to visit, dad would take us all fishing. When you are used to solitary time on the water, the addition of four children under the age of nine can be chaotic in itself. On one such trip I remember feeling displaced and hurt, because my father was lavishing his grandchildren with so much attention. I mean. . . REALLY? Didn’t anybody understand he was MY dad long before he was anything to them? I admit I was jealous and a little angry. I may even have subconsciously wandered off in the hope that he would come looking for me. . . his lost little “star.” It could have been my final curtain call. I remember running off, carrying my fishing pole and not really paying any attention to my surroundings. As I rounded a slight bend I tripped, sending my fishing pole flying ahead of me. It looked like the pole was resting on solid ground, so I jumped up to reach for my pole. As I did, the ground gave way beneath me and I felt myself plummeting straight down. I can still see the green, murky water and the bubbles rising around me as I began sinking. I’ll never forget the stench of that stagnant moss infested lake water. It engulfed my nasal passages and began entering my lungs. I frantically flailed my arms and legs in a panicked attempt to get my head back above the surface of the water. That’s when everything went blank. The next thing I recall is coming to on the bank of the lake surrounded by a group of unfamiliar faces including the man whom I later found out had just saved my life. I was relieved to see my father and couldn’t wait for him to grab me, and hold me, and tell me how sorry he was that he hadn’t watched me closer. Instead he yelled at me! He told me I had no business running off like that, and asked me if I understood that I could have died? It was definitely not the reaction I expected; and for a little girl who was scared and searching for reassurance, it is not only painful, but devastating, to hear your daddy is mad at you at the very moment you need him most. I allowed a singular, unfair reaction from my father to damage my willingness and possibly my ability to trust people for almost one-half of my adult life. I was always waiting for that proverbial “other shoe” to drop. I believe I was subconsciously searching for the pivotal moment in any given situation where my reality would suddenly fall short of my expectations and I would once again be left disappointed and confused. Thanks to an ironic and almost tragic twist of fate, I was given an emotional insight into what my father may have been feeling that day at the lake so long ago. At the time I was a single mom with six daughters and an infant grandson to take care of. Due to my lack of finances, opportunities to go somewhere and do something fun with these children were limited. It was a very hot day, and the girls and I decided to make a picnic lunch and go down to the river to cool off. Even though I do not care for natural bodies of water (as you can imagine) I reasoned that the water was fairly shallow and moving slowly; so I figured, “What could go wrong?” At the river, the older girls were floating on an inner tube, splashing around and having fun. 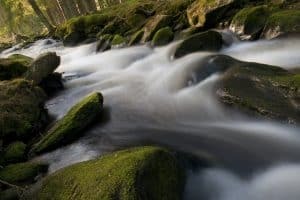 I was a little way downstream walking in the cool water holding my nine-month old grandson, enjoying the scenery when what still seems like a surreal and improbable accident occurred. I slipped on the slimy rocks on the riverbed! I fell and somehow my shoulder got wedged beneath a piece of large tree limb that had broken into the water. I was holding the baby above the water even though my face was five to six inches below the surface. I was lying on my back, staring up at my grandson as I prayed that the Lord would not allow my strength to give out before someone saved this precious child, I have no idea how long I held Jayden above me or how long I spent underwater. I vaguely remember him being lifted out of my arms, and then nothing. For the second time in my life I woke up, lying on the bank of a body of water, confused, scared, and basically traumatized. The first thing I did when I awoke was to check about his condition. I was told that not only was he just fine, but somehow he had barely gotten damp. The second thing I did, once I knew things were all right, was scream. In those stress filled moments, as the realization of what potentially could have occurred began to sink in, my perspective changed. My eyes and heart were essentially opened that day. I gained much needed clarity into what my poor father may have felt that day once he realized that I was okay. I suddenly understood that it wasn’t me he was mad at. He reacted the way he did, not because he didn’t care, but because he cared so much! My daddy was angry at himself for what amounts to poor judgment. It’s no crime, just an unfortunate side effect of being human. I believe it scared him to feel helpless, which I now understand completely I’ve been there plenty of times. I was able to leave three decades worth of resentment and bitterness on the bank of the river that day. I was also blessed to receive a much-needed baptism back into the world of faith and trust. I’m sure that there are more than two instances in my childhood that probably need to be reevaluated and put into perspective. For now, however, I feel comfortable moving on. My own plethora of parenting disasters and personal mishaps haven’t left me much room to nit-pick and point fingers at my own parent’s shortcomings. It’s amazing how smart your parents suddenly become once you begin to have children of your own. Having given birth to eight daughters over a span of fourteen years, I have certainly had ample opportunity to prove that parenting is not an exact science. With each baby’s birth, the chances and probability of failures and problems multiplied exponentially. Add to that my own struggles with mental illness, drug addiction, domestic violence, and the desperate search for my own identity, and you have a potential recipe for disaster. I want to make it clear that I never physically abused my children. I never cut them down or made them feel less than. When I was there, I always let them know how much I loved them and let them know that I had ultimate faith in them as the amazing humans that I knew and still know they are. My regrets lay in the knowledge that as their mama I should have always been there. My love for my children never wavered. However, my execution and follow through with the plans I envisioned for their lives, and my own, often fell desperately short of the mark. When they were young I essentially robbed them of the carefree, joyful adventure, childhood was supposed to be. I wasn’t present for too many holidays. Dozens of first and last days of school came and went without me. As they grew into young womanhood, and transitioned into mothers, I missed so many firsts. First crushes, first breakups, first babies. I was emotionally incapable of providing what they deserved; a shoulder to cry on, a friend to laugh with, and possibly a stronghold to cling to when the inevitable storms of life threatened to rage. I hurt them and that hurts me terribly. Yes, the choices I made, both good and bad, were my own. I can blame no one else. In my 47 years I have faced and endured a lifetime’s share of both emotional and physical abuse and mental chaos. There have been times that I was unsure I would even survive, myself. Regardless, I would face every traumatic, painful moment again and again if it gave me the chance to give back what I took from my children. Of course we all know that’s not possible. And regardless of my heartfelt sincerity, these words don’t amount to much more than a wistful anthem that loses it voice in the wind. For years I beat myself up and tore myself down, because of the guilt I felt over the pain and sadness I had caused. I was discouraged and almost broken, unable to face the challenges in my todays or consider making any changes in my tomorrows, because I was stuck grieving about my yesterdays. I’m not proud of my failures, no one ever is. However, you can only allow yourself to be mired down in the quicksand of regret for so long before you sink and it consumes you completely. You have no choice but to let go if you want to move on. Most of my girls have children of their own now and they understand how complicated parenthood can be. I know that they love me, in spite of my shortcomings, and they have chosen to forgive me. I will always be grateful for that. Now we have to work on trust. It’s one thing to apologize and or forgive. It’s another thing to learn to trust again, and it takes time. Forgiveness is the salve that can help even the deepest wounds heal. It is the light that shines at the end of the tunnel making the impossible once again seem possible. I knew I had to do something to stop the process and not allow my remorse to reel me back into the vicious web that had kept me stuck for so long. I fought my urge to continue hiding from the issue and quenched my inner desire to pretend the whole thing had never happened. I wrote to my sister to explain (or try to explain) to the best of my ability why I had done what I had. There was no real justification. I just wanted to let her know how sorry I was and to ask her forgiveness. I told her that I understood if she didn’t feel capable of giving it to me, and that I loved her and wished her nothing but blessings. There are times in life when all you can do is offer the olive branch and hope and pray the other person is willing to take it. One week later, thanks to the inner beauty and sweet nature of my sister and courtesy of the US Postal service, I received the closest thing to absolution I have ever known. As I opened my sister’s letter, my hands were trembling, and my heart felt like it would explode out of my chest. I began reading, and as I did I couldn’t hold back the torrent of tears. With each precious word that my sister had written, a layer of sorrow was lifted. To me each sentence she wrote was like a cleansing rain to my heart and mind. Not only did my sister bestow upon me the much needed gift of forgiveness for everything I did, or should I say didn’t do, to help her with mama. She also shared some things with me that I had dreamed of hearing, but figured they would never be a reality. She told me not only had my mom forgiven me a long time ago for my shortcomings and the problems my behavior had caused, she also shared that mom had never stopped loving me and always believed that I would eventually get it together. Thank you Mama for believing in me and loving me, and thank you both for your willingness to forgive. I needed my beautiful daughters to forgive me for my fumbled attempt at parenting which gave me the strength to forgive myself and begin changing. I now have the ability to use my prior stumbling blocks as stepping-stones toward success, instead of tying them around my neck and weighing myself down, causing me to sink even further into the darkness. Now with the knowledge that my mom and sister have forgiven me, I feel like a soldier who finally has come home from the battlefield previously wounded, but healthy and alive. Thankfully as a direct result of the phenomenal life-long circle of forgiveness, I no longer have to sail aimlessly on the sea of regret. Now instead of the searing pain I used to feel in my heart when I thought of the past, I only feel a slight twinge, which I believe will eventually disappear in time. I sit here as I write this in a six – foot by six- foot concrete cell, rectifying a problem that should have been taken care of a long time ago. At times, forgiveness is all you need to move on. Sometimes you have to make amends, which is not always easy, but necessary. By not clinging to the past and wallowing in those painful realities we create, we give ourselves permission to let go of the excuses and begin to change for the better. In my life, one thing has become poignantly clear. Regret is indeed a Tragic Romance, and can blossom into a bitter relationship with destiny that can only lead to sorrow and pain and further mistakes if left to fester. On the other hand. . . forgiveness is a gift to be treasured and cherished, because within its gentle embrace lies the key that can be used to open the door to a beautiful new life and future. I am looking for the moment, or perhaps moments that have forever changed my outlook on life, and will help define my current attitude and future destination. I don’t have to look very far. Why? Because of the power of forgiveness and the spirit of change that it gives birth within one’s soul. Forgiveness is the opportunity! Forgiveness is the moment, and that moment is always now. And now I am finally free.